May. 19, 2017 9:15 a.m.
Prime Minister Justin Trudeau brought his “sunny ways” brand of politics to a sunlit Abbotsford podium Friday afternoon. The prime minister is wrapping up a west coast tour that began in Seattle, where he met with Microsoft executives and Washington governor Jay Inslee, and made several stops in Metro Vancouver, including a fundraising dinner last night. This morning he was in Cloverdale, where he visited the Don Christian Recreation Centre to discuss the federal Canada Child Benefit. Trudeau gave a 10-minute speech at the Gur Sikh Temple after partaking in prayer and touring the national historic site. “It’s a tremendous pleasure to be here at the Gur Sikh Temple in Abbotsford, which has been a pinnacle of this community for over a hundred years,” he said, addressing the crowd of more than 250 people gathered, including local MPs, mayors, councillors and leaders of faith communities. In his speech, Trudeau extolled Canada’s strengths as a multicultural nation while also acknowledging its failures and missteps in its history, including the treatment of indigneous people. Upon their return to India and docked at Budge Budge, a riot erupted as passengers resisted arrest by British police. Nineteen died and many more were arrested. The prime minister also spoke about 2017 being Canada’s 150th anniversary since confederation. 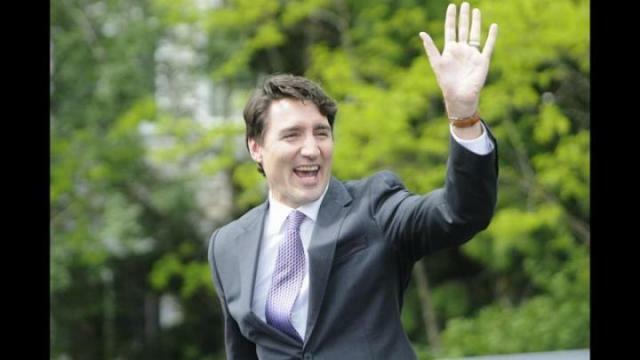 @JustinTrudeau @AbbyNews Turns out the prime minister is as susceptible to May long weekend traffic as the rest of us. Currently 30 minutes late.